It is always a privilege to be published in some great publications back in Michigan. This week, the Holland Sentinel published my article about my reflections on my trip back to Michigan last week. I have always believed that this crazy journey to China would lead me back to Michigan someday…and do not believe that I’m alone. Last week, my family and I gathered in beautiful South Haven to celebrate the 60th wedding anniversary of my grandparents, Neil and Phyllis Redford. It truly was a once in a lifetime occasion. As families get older, and kids grow up and move away, these special moments become more profound and important. 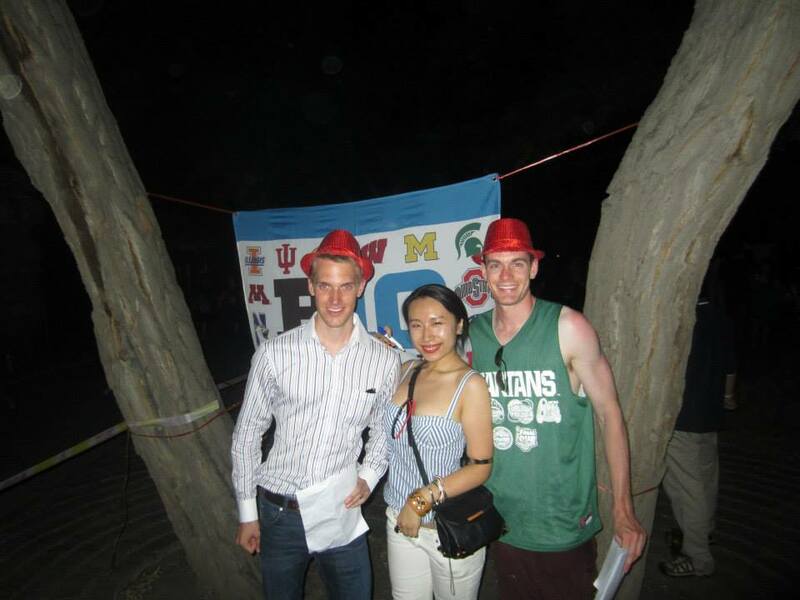 Soon after graduating from Michigan State University, I moved to Beijing, China. I often proudly remark to my colleagues here that I am from the most beautiful state in America. During my time in South Haven, I was reminded by just how true that really is. The life of a 25 year old doing international business in one of the world’s most dynamic cities is certainly exciting, but there is no comparison to the comfort and joy I felt walking the streets of South Haven and swimming in the pure waters of Lake Michigan. After living two years in disgusting, polluted Beijing, it was overwhelmingly refreshing to daily breath in the fresh air. Even more inspiring than the climate were the people. The beaches were lined with parents and kids taking in the sunshine, making sand castles and doing all the “good stuff” that young families do. In town, the streets were filled with dad’s carrying their daughters on their backs, and little boys trying to eat ice cream cones bigger than their heads. These are the moments and the memories I carry with me back to China. Pure Michigan is a dream that I am working towards; a dream to live out my life raising a family in a beautiful place with fantastic people, just like my grandparents. Since leaving Michigan, I’ve come to understand that this dream is indeed a monumental challenge, not just for me, but also for the state of Michigan. There is a lot of darkness behind all of the sunshine I’ve just described. With many high profile problems, such as the recent Detroit bankruptcy, we know that despite all of the beauty, many people across our state are hurting. In the midst of all of this, young people like me are leaving the state in droves. In March, one of the hot discussion topics of Governor Snyder’s Economic Summit was how to reverse the brain drain of many Michigan college grads that ship out to places like Chicago and New York every year. Amy Cell, who serves as Vice President of the Michigan Economic Development Corporation for Talent Enhancement, has been doing a great job building programs to aid young people to build their careers within the state of Michigan. These efforts will ultimately be successful, and may be even more effective than the numbers suggest. Michigan is an attractive place for many young people – just maybe not right now. We live in a globally interconnected economy. Many of us are just on a journey to figure out what is out there. During this journey, we are building global networks and accessing global resources that eventually we will bring right back to where we were headed all along – Pure Michigan. All we need is a few years to spread our wings. I could not have asked for a more vivid example of how this works than one evening I had at a restaurant in Sawgutuck. As three generations of my family gathered for dinner with grandma and grandpa, I noticed that sitting behind us was a table with some Chinese guests. I went over to talk with them, and it turned out that they were from Guangzhou and were meeting with their Holland-based partner, AlSentis, to discuss a business deal. We exchanged cards and I plan on meeting them the next time I go to Guangzhou. I believe that Michigan’s best days are still ahead. With beautiful, friendly cities like South Haven and Sawgutuck, it will continue to be a place that offers a quality life that young Michiganders gravitate to and will eventually return to after our exploring. This is the formula for a purer, more global Michigan. I was privileged to have been introduced to the potential for U.S. – China relations while a student at Michigan State University. However, I’m well aware that across the United States, many remain skeptical and frankly, uneducated about what is going on in China. In the midst of the chatter over China’s trade data report Thursday, there it was: Sinophobia. By establishing the scholarship fund, Schwarzman said he aimed to produce individuals who would understand China. An effort is underway to teach the US about China. In 2006, a survey by the Modern Language Association – the organization for scholars of language and literature – showed that some 51,600 students at roughly 2,800 US institutions of higher learning were studying Mandarin – a 51 percent jump in comparison with a similar study four years earlier. The enrolment jump, MLA said, was mainly due to China’s increasing prominence on the world economic stage. For the record: Chinese is the most spoken language in the world, and more people speak English in China than speak it in the US. But deeper obstacles can get in the way of attempts to change deep-seated attitudes about China. That’s the view of Tom Watkins, the former Michigan state schools superintendent and frequent China visitor, who has advocated stronger US-China ties for three decades. Redford recalls being in a meeting with a local official in Michigan who claimed “he’d rather go to India on a trade mission than China because he preferred to deal with democracies, not communists”. Unlike the analyst who saw China’s rise as a “for-better-or-worse” proposition, Redford believes the US will help its own cause by educating citizens about the changing of the guard that is well underway. On Friday, New York Times China correspondent Edward Wong wrote a telling, and frankly chilling, piece about the harsh realities of living in the filth of Beijing’s air pollution. As a young American, then, it seems to make sense that the health risks that I face living in the filth of Beijing’s air is not nearly as numerous as for young kids or babies and older people. For me, though, the effects are still deep. As Wong alludes to in his op ed, it really comes down to how the air really enslaves one’s mind as much as one’s body. 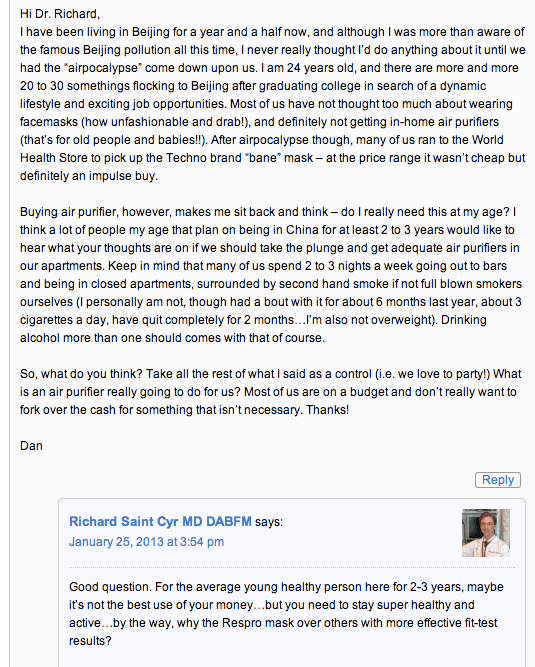 If I develop lung cancer sometime down the road, will I be able to attribute it directly to the years I spent in Beijing? Probably not. More than just the physical health risks posed by the air pollution is the damage to my overall quality of life and the general way I think and feel every day living in filth and ugliness. I love the beauty of God’s creation. And I hate that most days, the smog hides all of that. 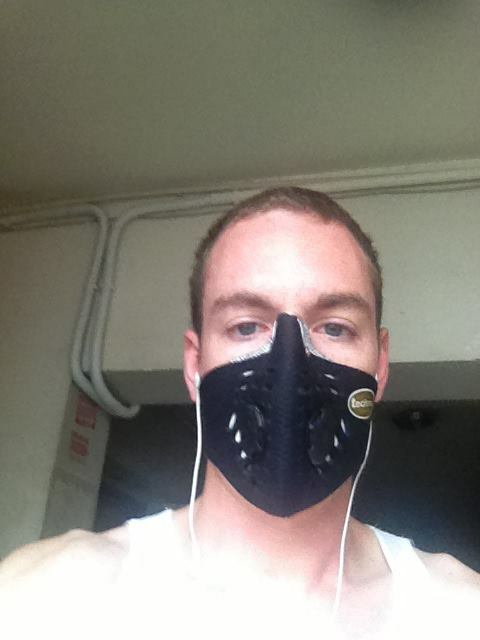 Even though I know that it really doesn’t make much of a difference, I still will put on my “bane-mask” air filtration device to even feel comfortable riding my bike outside. That is not freedom. The air has allowed a little devil to crawl into my head, reminding me everyday of the cloud of carcinogens that is all around me. They say that what doesn’t kill you makes you stronger. For me, Beijing’s air pollution just grows my appreciation for the home that I love the most, Pure Michigan. Still, for now its merely temporary. Soon, I’ll head back to my home in Beijing where I struggle with the daily decision to either ignore the reality of the black air that surrounds me, or take active steps to manage my life in the interest of my long term health. At least I know that when I finally decide my journey in China is over, I’ll walk down the road that I’ve been on all the while. The road that leads to God’s country, a place where the beaches are clean and the air is fresh. The road back to #puremichigan. What is China saying about the Detroit bankruptcy? Obviously, some of the biggest news to come out recently in Michigan, and quite frankly, the nation’s, history, was that of the Detroit bankruptcy. Since I live in China, I took the liberty of compiling a few headlines from major Chinese newspapers and e-zines to give you a glimpse into what Chinese media is saying about the bankruptcy. Indeed, Detroit has a long way to go to change the perception as a crime-ridden, impoverished place. Here’s to looking up!! Posted on July 30, 2013 September 17, 2015 Categories China Business, Pure MichiganTags China Outbound, Detroit, economy, MediaLeave a comment on What is China saying about the Detroit bankruptcy?